Our Event Aggregator service allows you to import events from outside calendars. This tutorial covers the process for import events from an ICS file. 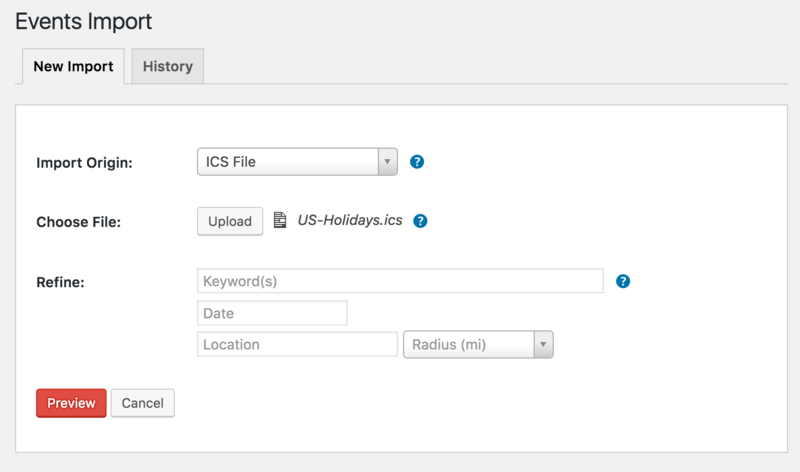 Instructions for importing from feeds and urls are available in a separate tutorial. ICS is a type of file that contains calendar information from a calendar application. You can tell something is an ICS file because those three letters are the file extension, e.g. `example.ics`. An ICS file is a format that is recognized as a global standard for formatting event data. If you open an ICS file in a text editor it will look like gibberish, but that is the information that is recognized by most of the leading calendar applications, including Microsoft Outlook and Apple's iCalendar. 🔔 Note: Event Aggregator can import events from iCalendars either from the calendar URL (as detailed here) or as an ICS file which is uploaded to your site. This tutorial is specific to the ICS file. Despite ICS being a globally recognized format for calendar data, not all calendars support it. Any events you want to import need to be in a calendar which is capable of exporting an ICS file from the application options. The exact instructions for your calendar application may differ from the above and depend on the application. If you have any questions about how to export an ICS file for a specific application, it might be worth reaching out to the maker of the application for more guidance if the process is not immediately understandable. The following steps will allow you to import events into The Events Calendar with an ICS file using our Event Aggregator importer system. Log into the WordPress dashboard of your site then navigate to Events → Import. The first step on the screen will ask you to identify the source of your new import. Select ICS File from the list of options. Click upload and select the ICS file from your Media Library (or upload it from your computer and then select it). Click the Select button to return to the Import Screen. You can also refine your import to specific calendar events by keyword, date and location- or skip the filters and allow the entire file to be imported. This preview shows you all the events available to you in the file. It provides you with a chance to search for specific events, select only the events you want to import, or simply check the content before everything is imported. Draft: The content will not be published but available for editing after the import. Pending Review: The content will not be published or a draft, but labeled as being ready for a WordPress editor or administrator to review before it is published. Private: The content is published to your site right away, but only accessible to those who are logged into the site and with permissions to view the content. The status you choose will apply to the event as well as any new organizer or venue created by the import. You can also assign an Event Category for the imported events. This category will be added in addition to any categories defined by the feed itself. Once you have everything configured, click the Import button and your events will be added to your site's calendar.